Conjuring the rugged beauty of Yorkshire’s country wilderness in ‘just’ spring, Rhubarb Rhubarb! is tart, refreshing and robust – like its signature pink-stemmed ingredient. Starring ‘forced’ rhubarb extract – a rich source of vitamin C and loaded with natural antioxidants – this gentle Hand Wash eliminates dirt without leaving your skin feeling stripped or uncomfortable. A gorgeous gift for a green fingered friend, this brings the allotment indoors with its distinctive fragrance, and is sufficiently gentle (but effective) for even the most obsessive hand-washers. The perfect addition to every kitchen, bathroom and posh potting shed. 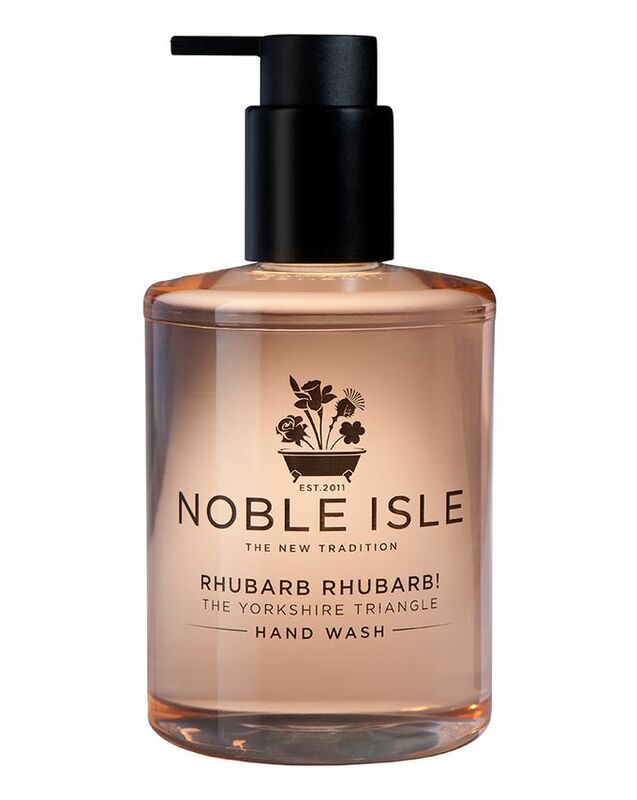 Powerfully evocative, Noble Isle’s Rhubarb Rhubarb! Hand Wash elevates a mundane task to a divine experience with gentle, skin nourishing ingredients and the bittersweet zing of rhubarb and rosemary. Inspired by the spirit of the British Isles in their infinite variety – from misty moorlands and old English orchards to Highland distilleries and windswept coastal cliffs – Noble Isle’s luxurious bath and body range employs the finest fragrances and natural extracts to create a lasting sensory impression. Blurring the boundaries between perfume and body care, this exquisite cleanser has top, middle and base notes - scents of rhubarb and juniper berry are followed by rosemary and tarragon, then cedarwood and moss leave your hands veiled with a subtle yet sensuous fragrance. The ‘forced’ rhubarb extract – the key ingredient in Rhubarb Rhubarb! – is sourced from the renowned West Yorkshire Rhubarb Triangle, where farmers still gather their harvest by the gentle light of candles, before extracting the fruit’s precious tonic. Use to delicately cleanse hands. I am so in love with this. The scent lingers long after using and definitely helps keep my hands soft during the winter months. Feels and smells great on my hands. After having used this hand wash while staying in a hotel I looked around to buy some but it's not too easy to get ahold of (at least not anywhere near me). I was delighted to find it sold by Cult Beauty. It's not inexpensive for a hand wash, but it is beautiful and I keep it in the downstairs washroom so it doesn't run out too quickly!